Home Mobile ViBe Android App Adds Support for SMS Messages, Premium Vibration Patterns. ViBe, the (free) Android app that lets you set vibration patterns for your various phone contacts, released a major update to it’s app into the Android Marketplace today. Version 1.11 of ViBe, that went live today – on 11/11/11 (coincidence?) – now includes support for custom vibration patterns for your incoming text / SMS messages on your Android phone. This is a big deal because we all know how many text messages we receive these days! The update also lets you purchase premium vibration patterns from within the app. Behind the scenes, the app uses the Android Google Billing systems along with Paypal for Android versions 2.2 and above, and uses just Paypal for Android 2.1 version. SMS Support: You can now set custom vibration patterns for incoming SMS messages! So you’ll now be able to tell who is texting you from the distinct vibration pattern. Premium Vibration Patterns: Users can be really unique and get premium vibration patterns (ViBes) now. Android 2.2+ users can use the Android Google billing system or Paypal while Android 2.1 users can get these premium vibration patterns (ViBes) using Paypal only. Vibration Pattern for Groups: You can now group multiple contacts in your android phone’s address book and assign the same vibration pattern to everyone in that group of contacts. Custom Default Vibration Pattern: You can now change the default vibration pattern to the ViBe pattern of your choice. 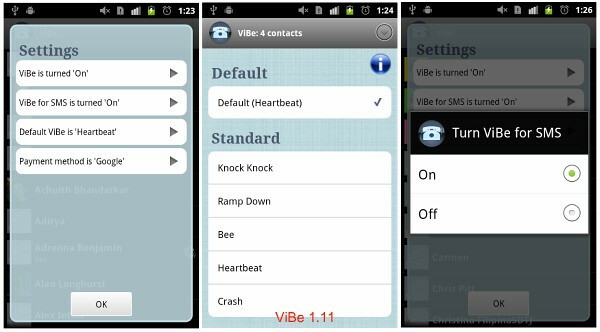 For instance, if you really love the ‘heartbeat‘ pattern, you could set this as your default for all contacts through one setting within the ViBe App. One Response to "ViBe Android App Adds Support for SMS Messages, Premium Vibration Patterns."